The Therma-Stor HI E Dry 195 Dehumidifier is a high capacity unit which will suit a wide range of commercial applications and is well suited for use as an indoor pool dehumidifier. The 195 shares all the virtues of the HI E Dry 100 but offers substantially greater water extraction capacity to operate effectively in even larger areas. Optimized for indoor pool applications the unit is also suitable for use in health and fitness facilities, archiving areas, food and drug facilities, manufacturing plants, computer rooms and graphics production and processing premises. 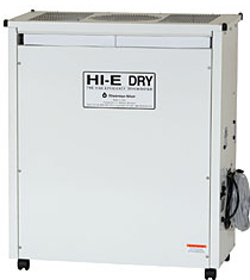 The HI E Dry 195 Dehumidifier is a powerful unit with a water extraction rate of 183 pints per day. This rate was achieved in testing under the conditions specified by AHAM (Association of Home Appliance Manufacturers) of 80°F and 60% relative humidity. AHAM sets a standard for test conditions to enable potential users to make meaningful comparisons between dehumidifiers. Many suppliers of dehumidifiers to the US market adhere to this standard and it is commonly used. Water extraction rates rise and fall with increases or decreases in temperature and/or relative humidity. At saturation, for example, the water extraction power of this unit doubles, to 366 pints per day. In the conditions which prevail in indoor pools, and other high-humidity applications, this unit may be expected to achieve a higher extraction rate than at AHAM conditions. Although optimized as an indoor pool dehumidifier the HI E Dry 195 will be equally suitable for related applications such as spas and hydro-therapy facilities. Constructed to commercial standards the 195 has a wide range of potential applications wherever high humidity is a problem and an efficient, effective and powerful dehumidifier is required. The HI E Dry 195 Dehumidifier is a very flexible unit and one aspect of its flexibility is the range of ambient temperatures within which it is able to operate effectively. At the bottom of the range its low temperature operation limit is 33°F. This is achieved by an effective auto-defrost system which thaws ice as it forms on the condensation coils. This device enables the 195 to operate down to what is the effective minimum ambient temperature in which any refrigerant dehumidifier can be effective. At the top of the scale it will continue to perform up to 110°F, a feature which is of particular value in the warmer environments for which it was designed. Equally important is the high energy efficiency of the HI E Dry 195. By taking air that has already passed over the condensation coils and using it to pre-cool the newly incoming air the unit is able to extract more moisture from that air as it, in turn, passes over the coils. This is achieved without using additional energy and is estimated by the manufacturer to make the 195 as much as 200% more efficient than conventional refrigerant dehumidifiers. In addition to lowering energy costs this also reduces the "carbon foot-print" of this unit. Another energy saving feature of the HI E Dry 195 Dehumidifier is its adjustable humidistat. This can be programmed for a relative humidity ranging from 20% to 80%. The unit will operate continuously until the pre-set percentage is achieved. Thereafter the unit only operates to maintain the programmed level, cycling on and off as required. In addition to reducing power use this effectively automates humidity control and provides stable conditions without further intervention by the user. A remote humidistat is available as an optional accessory. The HI E Dry 195 Dehumidifier is equipped with an integral condensate pump with a vertical lift capacity of up to 17 feet. This allows the condensate to be discharged continuously to a drain at a floor level above the unit without the inconvenience, cost and untidiness of installing a separate pump. In the same way as the HI E Dry 100, the 195 is configured for multiple ducting options which allow the unit to be operated as a stand-alone unit, to dehumidify several smaller enclosed spaces or to do its work out of sight and earshot of customers in public areas. Collars are available on the unit for ducting both input and output air flows and either one, or both, may be used according to user requirements. The unit has been designed to operate from a standard 115v circuit further simplifying installation. Air filtration is provided by two 2-in. thick, pleated media air filters for improved air quality. The filters are washable and may be replaced as required, usually once per year. The 195 is a large unit with exterior dimensions of 36.6 x 19 x 42 inches although, for its power, it is a compact dehumidifier. Its weight of 175lb is made easier to manage by the provision of caster wheels for movement across unobstructed floors. The HI E Dry 195 Dehumidifier is a strongly constructed and durable unit which comes with a five year warranty, year one parts and labor, years 2-5 sealed system parts.